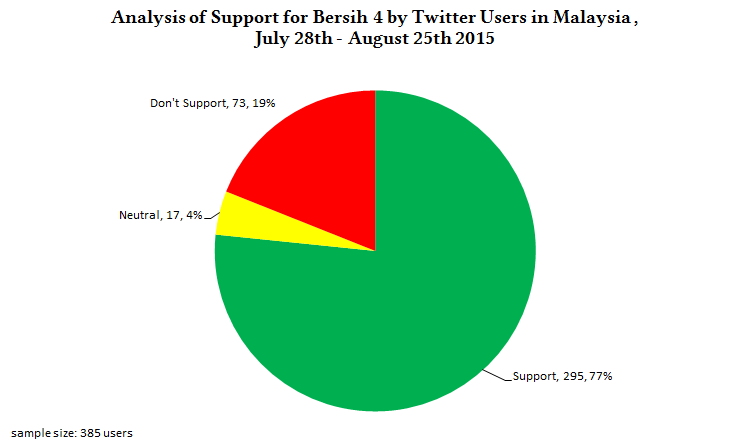 We performed opinion-based analysis on 385 users based in Malaysia who tweeted about Bersih 4 and related terms from July 28th – August 25th 2015. The margin of error is +/- 4.99%. Our goal was to gauge public support by Twitter users in Malaysia for the Bersih 4 rally taking place from August 29th – August 30th in Kuala Lumpur. These users supported the Bersih 4 rally. Many expressed interest or plans to attend. The most common reasons for support were unhappiness with the government and unhappiness with the economy. These users supported the Bersih 4 rally and expressed interest in Najib stepping down as Prime Minister or being arrested. As in the previous category, many expressed interest or plans to attend. These users were indifferent to the rally being held or expressed conflicted opinions. 9 users (2.34% of the total) believed that Bersih supporters were responsible for the defacing of the wall murals in Penang. They did not support this behaviour. Users tweeting about Bersih also expressed the following opinions/sentiment on related topics. This listing was summarised based on a manual reading of a sample of 1,358 users in Malaysia, inclusive of the sample used for the above analysis. These expressions are not indicative of their views on Bersih, but we are including it here for informative reasons. Many users expressed opinions about UMNO (more than other parties). Praise for UMNO outweighed criticism by a small margin. A majority of pro-UMNO users were anti-Najib. 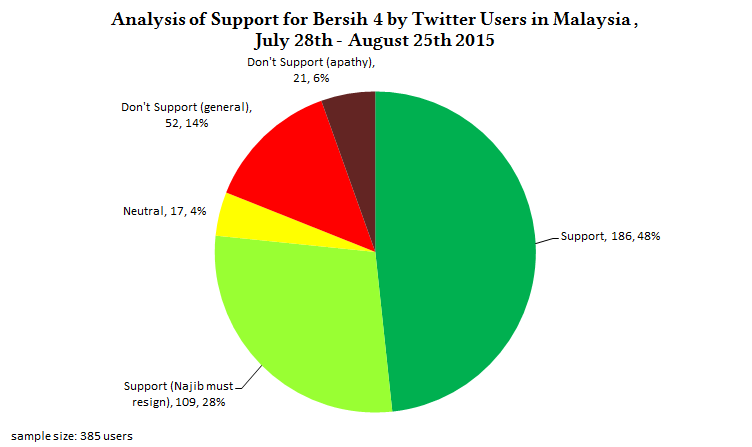 Less than 8% of the total users tweeting about Bersih expressed support for Najib. UMNO supporters (who were anti-Najib) tended to express support for Bersih because they wanted Najib to step down. A few stated they would be joining the rally. Distrust of them in general e.g. ‘Support Bersih but don’t support DAP/Opposition’. There were PKR and DAP members expressing support for their respective parties and Bersih. Criticism of the Penang state government for having a state-level Merdeka theme instead of being united. A slightly smaller number of users found it to be a non-issue for the state to have its own theme. Allegations of DAP being funded by Jews were considered nonsensical. These users did not necessarily support DAP but they did not support the allegation either. Some praise for DAP for being better than UMNO; for being a better choice for Malay liberals/progressives; or for being the best among the Opposition parties. It is worth noting that most of this praise came from Bahasa Malaysia speakers, though there was more criticism than praise. Bahasa Malaysia speakers offering praise came mainly from Selangor and KL with a few from Penang and Perlis. Sepura Othman (@youngsyefura) was the most popular among Malay speakers. These users were concerned about the Malay rights or control of the government threatened. They want Najib to step down so UMNO stays in control. Despite the sharing of these concerns, many users were offended by Najib stating that ‘Melayu akan terbangsat’ (https://www.youtube.com/watch?v=l-bGizz6ehU). The use of the word ‘bangsat’ may have been too extreme, or anti-Najib sentiment is so strong that users will feel offended by anything he says. Offense was directed mainly towards Najib instead of UMNO. These are other opinions expressed by a minority of users. People who were unable to get a signal within dense areas of the crowd were able to get a signal once they moved out of the crowd. Photos of a vehicle with antenna alleged to be a phone jammer were popularly shared during Bersih 3 and have started being shared again. However the antenna appears more similar to cellular repeaters than jammers. There is no evidence to support this belief but people are repeating it. Some misinformation being spread that Bersih had sold 1.2 million t-shirts. This is the reported figure for the amount of donations received but someone had changed it to refer to t-shirts instead of ringgit. We were unable to trace when this rumour started. Using the same interface provided by Facebook, we are able to measure user interest in Bersih. This includes users who share Bersih-related content/news/media as well as those who ‘like’ the official Bersih 2.0 page. Interest should not be interpreted as support, but rather as awareness. These statistics were taken on August 25th. Male and female stats do not add up to the total due to rounding issues by Facebook and possibly hidden gender details. 610,000 users aged 13 and above in Malaysia are interested in Bersih. There are 380,000 men and 220,000 women. 62.30% are male and 36.07% are female. 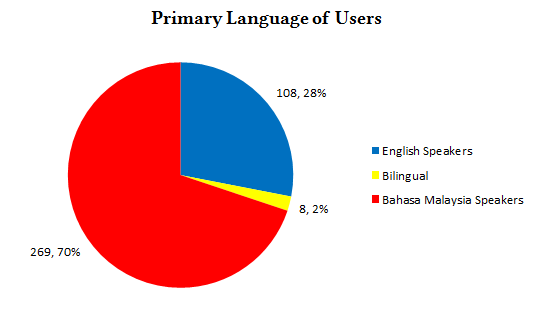 3.39% of the total population of 18 million users are interested in Bersih. The table below shows the division of interest by age group. The ‘Msia %’ column shows the % distribution for that age group for Malaysia’s users. The ‘Diff from Msia’ column shows the difference in percentage points between Bersih’s age distribution and Malaysia’s age distribution. From this comparison we can see that Bersih has drawn increased interest from users aged 21-40, particularly users aged 21-30. Based on this and our own opinion analysis of Twitter users, we can say that university students and fresh graduates have the highest interest in Bersih. By comparing user interest by state with the current population distribution we can see how balanced interest is and whether the issue draws more attention from certain states. The table below shows the division of Facebook user interest by state. Due to an overlap between users from both states, we have shown the combined totals for KL and Selangor. Interest in Bersih from Putrajaya users were too small to be measured. The ‘Diff from Msia’ column shows the difference in percentage points between Bersih’s state distribution and Malaysia’s state distribution. From this comparison we can see that there is increased interest primarily from users in KL and Selangor (combined) and Penang. 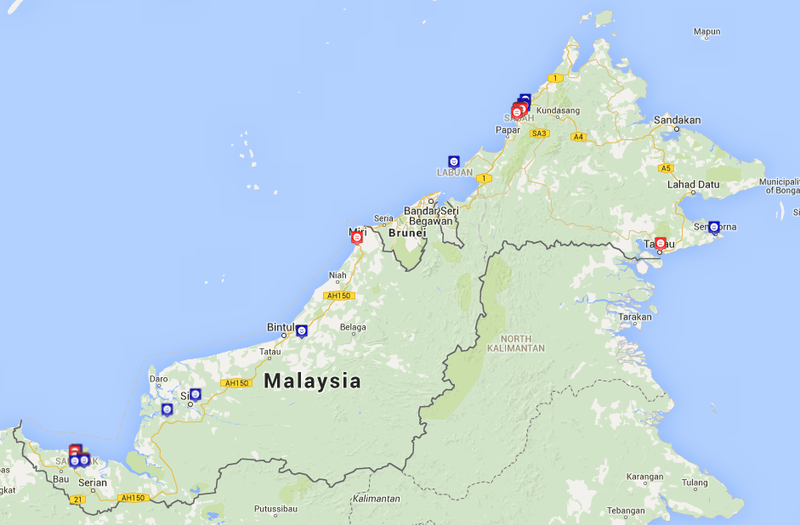 There is reduced interest from users in Sabah, Sarawak and Labuan. There is increased interest on a smaller scale in other states. The table below shows the division of Twitter user interest by state. This is based on a sample of 9,325 users tweeting about Bersih. From this comparison we can see there is reduced interest from users in Sabah, Sarawak, Labuan, Johor and KL. There is increased interest from users in other states primarily Selangor, Perak and Melaka. Both the Facebook statistics and Twitter statistics indicate a reduced interest from East Malaysia. 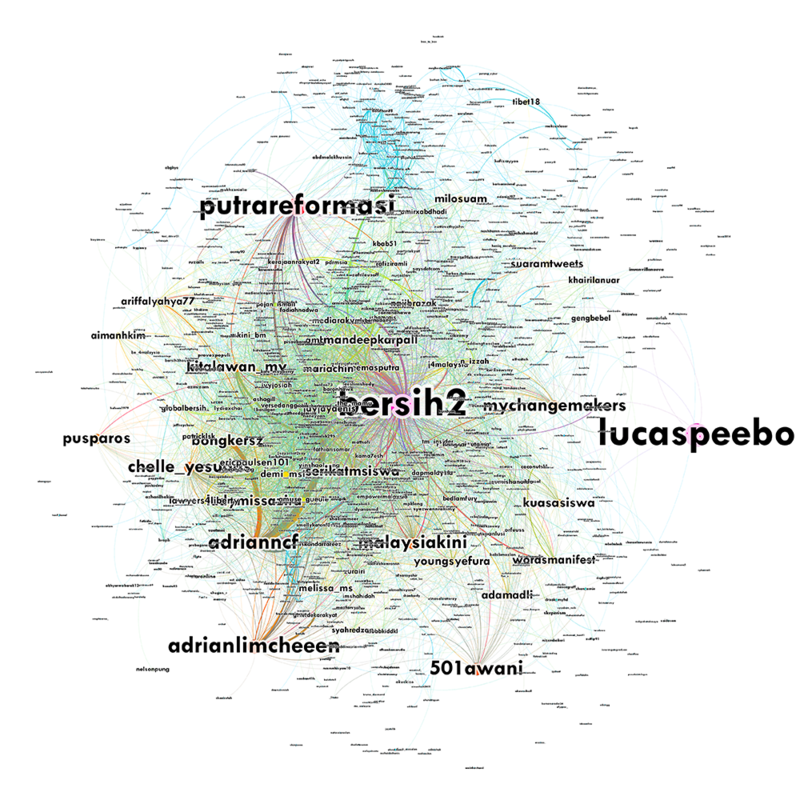 This network graph shows how Twitter users tweeting about Bersih and related terms from July 28th – August 25th were connected. This includes all users on Twitter limited to those who retweeted or had conversations with each other. This helps visualise the scale of the conversation. 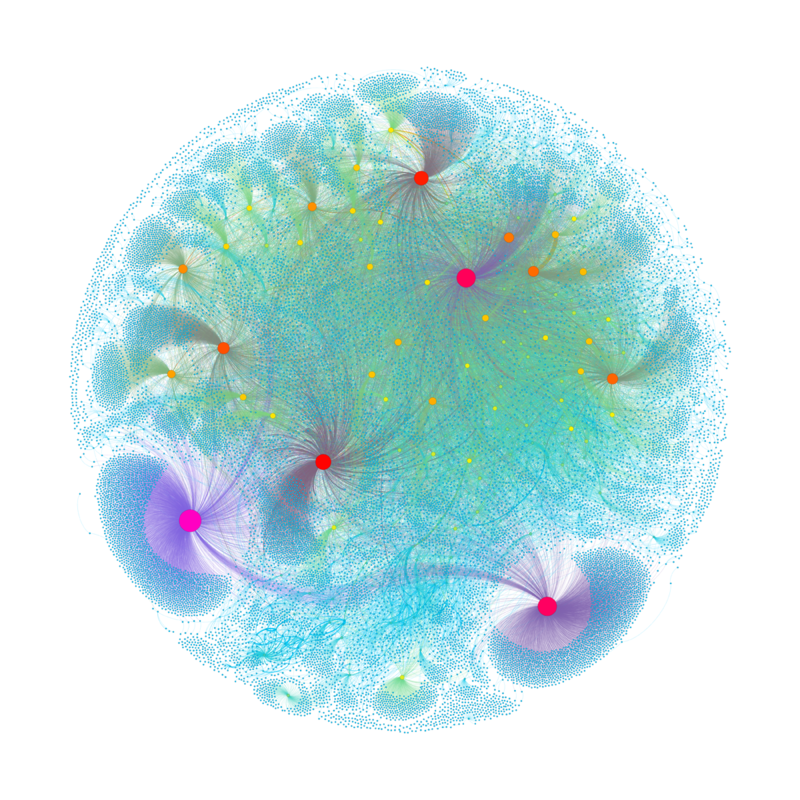 Each user is represented by a node (circle) that is coloured based on the number of their tweets that were retweeted and the number of tweets sent to them. The more attention they receive, the larger the node. Any node that retweets another node or tweets to another node is connected. Nodes are positioned based on their connections to other nodes – strong connections pull them closer. Large nodes are considered influential within the network. We have coloured the nodes based on a scale of blue (least influential) to green; yellow; orange; red; and purple (most influential). High connectivity between these users indicates conversations and retweets happening between them. This is effective for campaigning provided that each user has its own base of followers. If the number of shared followers is high then it becomes counter-productive as they end up preaching to the converted. Due to the resources required we are unable to perform a follower analysis of these users to determine their actual reach. 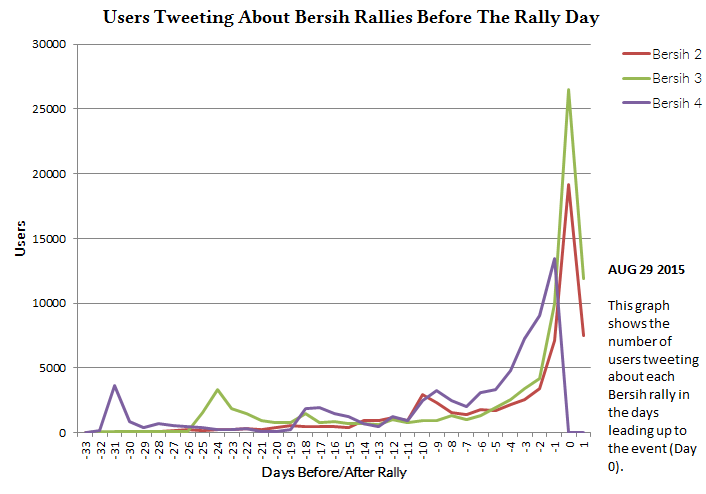 The chart below shows the level of interest from users on Twitter for the Bersih 2, Bersih 3 and Bersih 4 rallies. The graphs have been aligned to the number of days before each event. Interest in Bersih 4 started out strong on the day it was announced (Day -31) however interest remained low until Day -18 when rally points were announced. Online campaigning and media coverage of events related to Bersih kept the interest going as the day of the rally approaches. 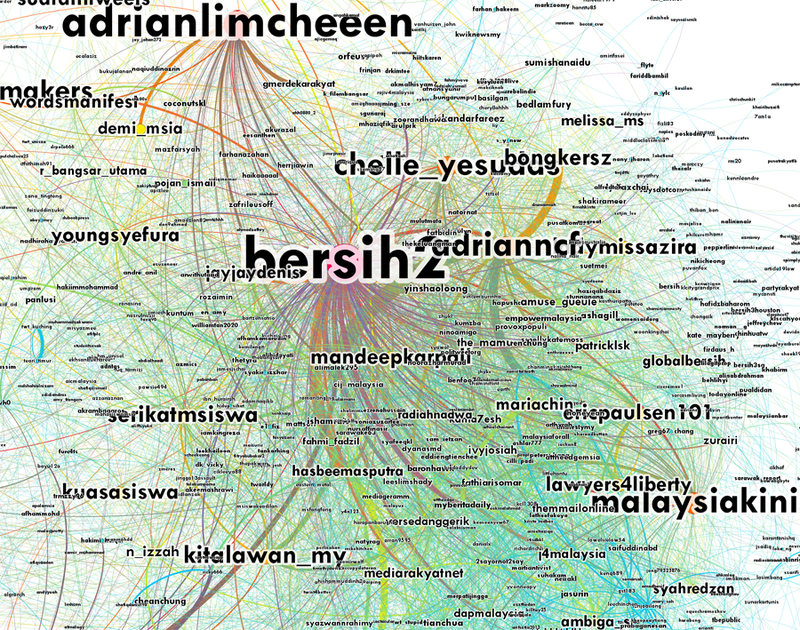 27,012 users have tweeted about Bersih 4 from July 28th – August 27th 2015. The analysis indicates that the majority of Twitter users in Malaysia tweeting about the Bersih rally were supportive with 28% of users wanting Najib to step down. Both Facebook and Twitter are mediums that are used more by people in KL and Selangor with 49.44% of Facebook users and 48.6% of Twitter users residing in both territories. The increased interest from users in KL and Selangor would indicate that there is a significant base of local users to attract through social media. As the main rally is in KL this would imply good turnout from locals. The chart below shows the scale of rallies we have measured since 2007. Bersih 3 drew an estimated 72,000 people in 2012. Himpunan Kebangkitan Rakyat drew between 63,000 – 78,000 people in 2013. Rallies since then have steadily reduced in size. The number of users tweeting about Bersih has not been high. In one month Bersih has drawn interest from 27,012 users on Twitter. For comparison, 58,962 users mentioned Najib Razak in one day on July 28th following the Cabinet reshuffle and removal of Deputy Prime Minister Muhyiddin Yassin from the Cabinet. 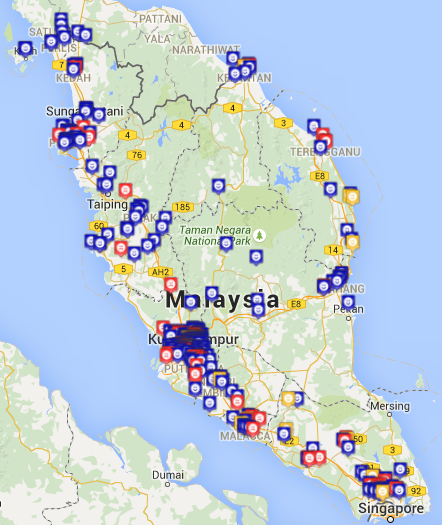 In the week leading up to the #TangkapNajib rally on August 1st, 15,013 users tweeted the hashtag. However between 50 – 100 people showed up for the rally. In Dec 2012 only 3.05% of Malaysia’s Facebook users were interested in Bersih. Such a low figure does not seem connected to the attendance of Bersih 3 or Himpunan Kebangkitan Rakyat. This shows that social media statistics are not a good indicator of rally attendance. During our analysis we noticed that only a few Twitter users were discussing staying overnight camping in the streets. Other users planning to attend the event only showed interest in staying in hotels. User discussions gave the impression they were treating it as a one-day event. Based on our analysis we can expect large numbers of youth aged 21-30 to attend the rally. Whether the number of participants can beat Bersih 3’s record is an open question. Attendance may peak between 2pm – 5pm on August 29th depending on whether police action takes place. Based on geo-tagged tweets, we are able to determine where users often tweet from. This is indicative of where they spend most of their time e.g. work-place, university or residence.